When the testator sits down to write a will, the document -- including notes, drafts, lists and letters to the estate attorney -- are private documents. The privacy of her documents does not depend upon attorney involvement. A testator handwriting a holographic will, for example, retains complete control over who views the document. Since a holographic will requires no witnesses, the testator can keep the will's existence private, as well as its contents. Executing a will means signing it according to the procedures required under state probate law. The requirements vary among types of wills and between jurisdictions, but every state requires that a testator sign a prepared will -- whether a form will, a typed will or a will prepared by an attorney -- in the presence of at least two witnesses. The testator affirms to the witnesses that the document is her last will and testament before she signs it. However, no state requires the testator to allow the witnesses to read or review the contents of the will. During execution, the document remains private. In her will, the testator names an executor, the person who will administer the estate. When the testator dies, the executor petitions to open probate and files the will with the probate court. He then collects assets, pays estate debts and distributes the property as set forth in the will. 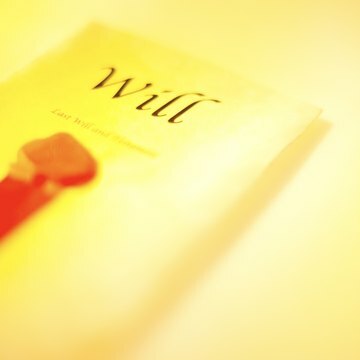 During probate, the will is a public record. Most court documents are public, and no states except probate documents from this rule. Any member of the public may inspect the will in the court probate file. Once the executor completes his work and distributes the estate among the testator's heirs, he closes probate. However, the court retains probated wills in its files. These wills, referred to as archived wills, remain public records open to public inspection. Currently, courts store archived wills on microfilm, but early records remain in original form. Members of the public look through indexes, organized either alphabetically or by date, to locate old wills.